It's Lynn here today and I'm so excited to get to share my first layout with you. I chose the Cracklin' Rose collection to do my project. I love the warm rich colors and I thought it would be perfect for the photo of my daughter cuddling our new puppy Daisy. 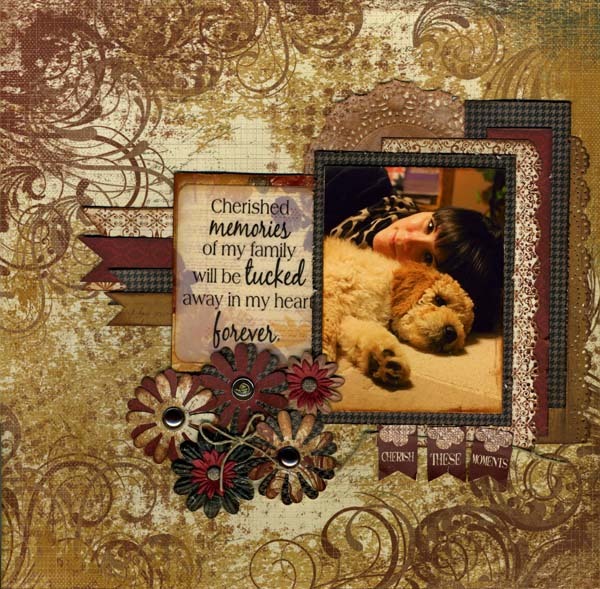 I loved the background paper so much that I used the 6x6 Paper Pad to add some strips to the sides of the photo. I also loved using the Mocha Mama PowderPuff Chalking Ink to add a vintage look to my photo and the paper strips. I used the left over pieces from the strips to punch out some flowers for my layout. Thanks so much for letting me share my project. I hope you all have a wonderful day! Lynn, this is a beautiful layout! I agree... the warm colors are perfect for that darling photo! Gorgeous! Love the use of these warm colors to pair with a fantastic photo! This is just adorable! Love Cracklin' Rose!